Nope, it’s definitely not the cramped, cantankerous Project 156, but the Victory Octane is many very good things. A small, boisterous hooligan of a power cruiser. An affordable, uniquely American bike. Most importantly, it’s a hell of a start for a custom build! Like Indian’s Project Scout earlier this year, Operation Octane is as simple as a global dealership contest gets: 3 months, 1 bike per dealership, no limits or restrictions. Being that Victory is (supposed to be) Polaris’s performance brand, most of the bikes are a lot more aggressive and capable than the Scouts. 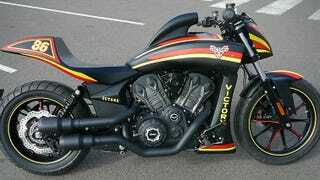 To start, let’s take another look at the Indian and Victory Motorcycle Center Poitiers’s NASCAR-inspired build. Octane Lighnting from MotoStrada Portugal. Lillith 69, the obligatory scrambler. Evil Ethel, a cool club-style build with some classic chopper nastiness blended in. Finishing out with Michael Delaney, a Steve McQueen-inspired build from Britam Bikes Ag, Switzerland. In its own way, this is wilder than the Poitiers Racer build! There’s a ton more bikes at the Operation Octane site, pick your favorite ones and vote for them! You could win one, but without the extra parts.